Splatoon is a parody of everything Nintendo isn’t. The shooter is the single most oversaturated and self-cannibalizing genre out there, but up until now, Nintendo hasn’t touched it. Splatoon is the team-based shooter reimagined by Nintendo, with bulky space marines and modern warfare replaced with kids who can morph into squids and guns that shoot colored ink. Although it has its issues, Splatoon breathes a new life into a genre that has felt empty for far too long. 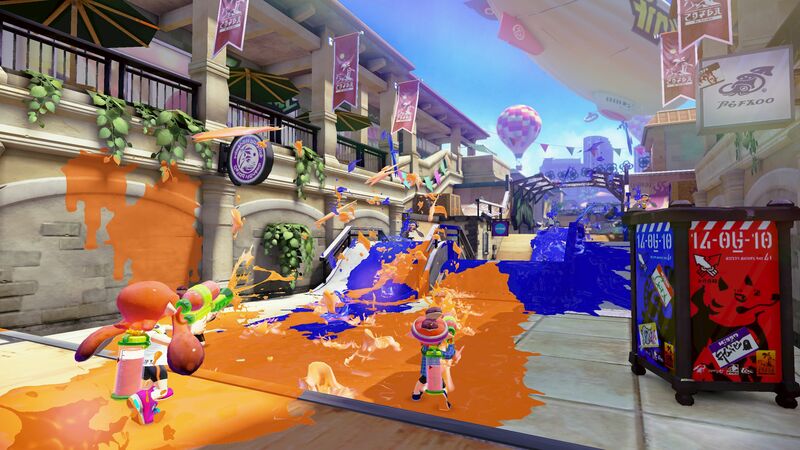 Players take control of an “Inkling” and are thrust into the city of Inkopolis, which serves as the game’s hub area. At the center of Inkopolis is a tower that leads to the game’s online multiplayer modes, letting you know right off the bat that this is a game built around its online modes. To the side of the tower are shops where players can purchase new weapons, shirts, headwear and shoes with the money they gain from winning matches. There’s also a crazy old man named Captain Cuddlefish found in a manhole near the tower, and he’ll lead you to the game’s single player campaign. The core gameplay works just fine for the most part. Players spread their ink through their various weapons, which come in three categories: Shooters are smaller guns that have shorter range, but can be fired rapidly and don’t use up ink as quickly. Chargers are long-range weapons that – as their name suggests – require a brief charge up time, but they cover more ground in a single shot. 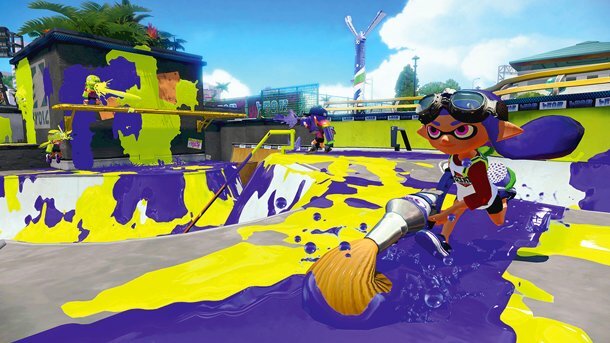 Then there are Rollers, which resemble giant paint rollers and brushes that cover ground in ink the quickest and are used as melee weapons against opponents. The Inklings can also transform into squids to swim through their ink to refill their ammo and move faster, and can even swim up walls. 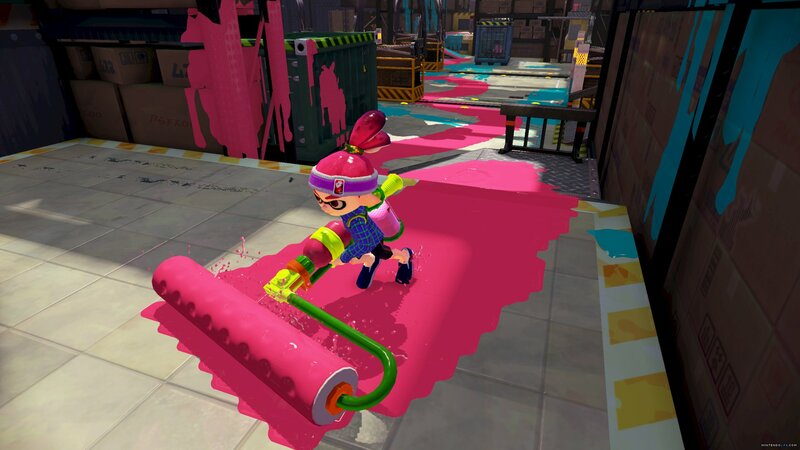 Each gun in the game also includes a secondary weapon (such as sprinklers that spread ink in all directions or shower heads that provide a shield of ink) and a special weapon (like the ability to transform into an invincible Kraken for a short time, or the devastating “Ink Strike” missile). The secondary weapons come in handy, but use up a lot of ink, so you need to be strategic with how you use them. In order to use the special weapons, you need to fill up a meter by spreading ink across the ground. If you get “splatted” by an enemy, you lose a good chunk of the meter, which prevents the special weapons from being too frequent. At first, I was a little disappointed that you couldn’t customize the weapon setup, as every main weapon is automatically set with a fixed secondary and special weapon. But when delving deeper into the game, it ended up being for the best, as it helps balance things out. The weaker main weapons usually get the more powerful secondary and special, and visa verca. The only downside to the control is that the Gamepad’s motion sensor is used for the camera. I have no qualms with motion-controlled gaming, but using it for the camera control in a game like this can feel a little awkward. Splatoon’s camerawork can get a bit cumbersome in hectic situations. You can set the camera back in place with a press of the Y button, but you’ll find yourself doing this more often than you’d like to. You can also use the right thumbstick to control the camera, but you really have to hold the Gamepad in place for that, since the motion controlled camera is so prominent. On the upside, the Gamepad provides a really useful mechanic that allows you to instantly jump to one of your teammates just by touching their icon on the touchscreen, which can be a lifesaver. As for the online multiplayer, it’s really fun and really addicting, though it does have some questionable limitations. Currently, there are two game modes (with more promised to be released in free updates). The first mode is Turf War, in which the goal is to cover more of the stage in your color than the opposing team within a time limit. The other is Splat Zone, which is Splatoon’s version of king of the hill, and requires players to keep one or two designated areas under their team’s color. Each team has a counter that ticks downward as they control these areas, and victory is achieved either when a team’s timer reaches zero, or the map’s overall time runs out, with the team whose counter is closest to zero claiming victory. Both modes are incredibly fun to play, but for some reason each one can currently only be played under certain circumstances. Turf Wars are relegated to regular battles, which are intended for more casual players, while Splat Zone is only available to ranked battles, which are more competitive as players can rise and fall through ranks (C- to A+) based on consecutive wins and losses. There are times when I wish I could be playing Turf War in ranked battles and Splat Zone in a regular battle, so it begs the question why the limitation is there to begin with. Another downer is that each mode is only limited to two randomly selected levels at a time (with the two available stages in each mode changing every four hours). The game has some great map design that really takes advantage of the various gameplay mechanics, so there are no complaints with the levels themselves. But you kind of wish there could be more maps available at any given time, and maybe have the option for players to vote on which one they play next. The game also features a local multiplayer mode, where two players try to pop the most balloons. It will be fun for some, but Splatoon was clearly made with online multiplayer in mind, so it’s tough to say how much lasting power the local play has. 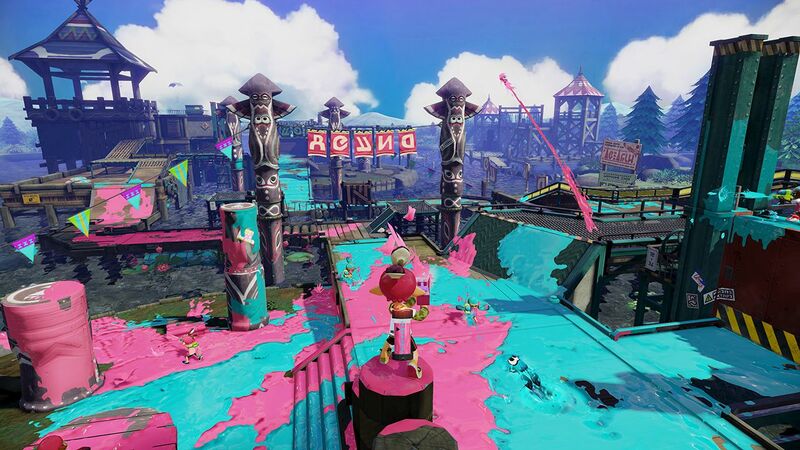 Splatoon’s single player campaign combines the shooter gameplay with platforming stages reminiscent of the 3D Mario games. It provides a good adventure with some fun level design, though it’s never as creative or deep as a Mario title. It does include some incredible boss fights, and you may find yourself pushing further into the single player mode just to experience them. The game has a very nice look to it. The character designs have a fun and nostalgic sense of 90s attitude, and the Inklings wouldn’t feel out of place as Sega Genesis characters. The world of Inkopolis also has a hipster/skatepark feel to it, which gives it a unique flair among Nintendo’s franchises. It also boasts some catchy music, which also sounds different from Nintendo’s norm with a more rock and roll influence. Overall, Splatoon does have some drawbacks due to the awkward camera and some odd limitations that Nintendo can hopefully lift as they continue to update the game. But the core gameplay of Splatoon is something wholly original and uniquely fun, and it makes the game absorbing despite the limitations. 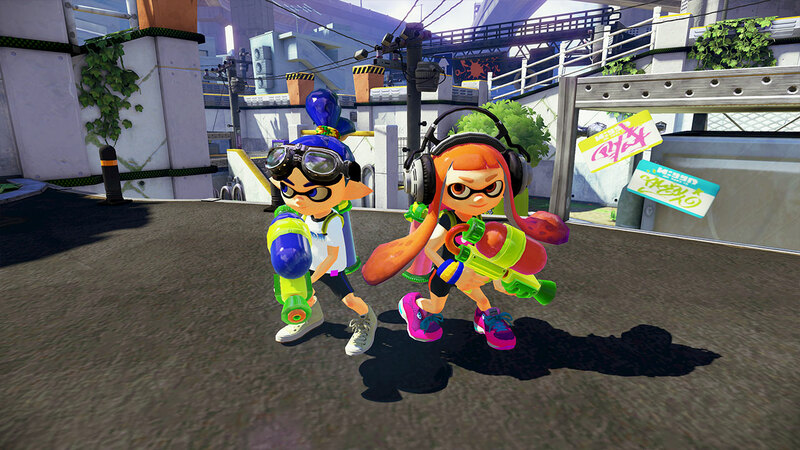 Add on the fact that there always seem to be new weapons and gear to purchase – with the clothing options not only providing visual differences for your character, but also granting special gameplay bonuses as well, which can gain even more such bonuses as the player levels up – and Splatoon is a game that will have you continuously coming back for more in a similar vein to Mario Kart or Super Smash Bros.
Splatoon may not be perfect, but it is its own little miracle. If imagination in the shooter genre is long-since dead, then Splatoon has brought it back from the grave. Awesome review! I have been playing the game for the past four days and I absolutely love it! I was also disappointed at how you can’t individually choose your main weapon, secondary weapon, and special move, but then – like you – I realized it was done for the sake of balance. I hope that, on a sequel, the team can find a way to make the game as balanced as it is right now while having that option available. My main complaint so far is the lack of content. I understand that it is a problem that will be fixed as the game gets updated (there’s an awesome new stage coming today), but I wish we had more modes and stages available from the get go. Besides, the limitation of – at a given time – only be able to play in two stages that are chosen randomly by the game is a bit frustrating. I have tried to figure out why they decided to do that, but I just can’t come to a conclusion. Why not implement a voting system where all of the stages are available (see Mario Kart)? Yeah, it would make waiting for battles a bit longer, but there is a huge benefit. Yet, I freaking love this game! It is insanely addictive… I am having trouble trying to stop playing it and going to bed! Nintendo has done it again, and I hope it becomes a long-running series that gets more polished as time goes by. It’s an insanely addictive game. I just don’t know why there are so many limitations in place with the modes and levels. As you said, there’s a lack of content right now (maybe Nintendo released it a wee bit early? ), but limiting Turf War to regular battles and Splat Zone to ranked battles only, as well as only two levels per mode at any given time, only magnifies the lack of content. Thankfully the gameplay itself is so much fun. Hopefully, with updates we will surely be getting through the next few months, the lack of content will go away. I am not sure it was a matter of releasing it too early. For some reason I am under the impression Nintendo is holding content back and opted for a strategy on which said content gets slowly unlocked. I understand it is something that keeps players interested in the game for a longer period of time, but the initial content should have been bigger. Agreed. Mario Kart 8 had more than plenty of content to begin with. They added DLC later, but the initial package already had so much to it. Splatoon could have used a little more at launch.